(Newser) – Some 300 earthquakes shook up Southern California in less than nine hours yesterday, and were continuing late into the night. 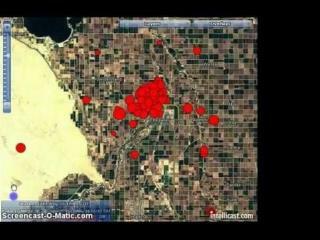 The "quake storm" was centered in rural Imperial County near San Diego. Most temblors were minor, but at least three hit magnitudes above 5.2. Windows were shattered and trailer homes were shaken off their foundations, reports AP, but no other major damage was immediately reported. "Obviously, all this activity is related or interconnected, but it doesn't really follow the typical main shock, aftershock activity," a US Geological Survey seismologist told the Los Angeles Times. Another thing, ObamaLiberalsSuck, your name is an oxymoron. Obama IS NOT a Liberal! He's a center-right DINO corporatist 1%er wana-be apologist! No true liberal will accept him OR vote for him! Hey ObamaLiberalsSuck you dumb Con, Did you forget that your precious hero Ronald Regan WAS FROM CALIFORNIA and also his library AND his body is buried there!? But you're right,according to your words. "GOOD RIDDANCE TO BAD RUBBISH!" Stop drinking the Kool-Aid, Dumb Con!